I went to a reasonably well behaved school, but I can't remember a single school trip that didn't result in at least one brief burst of chaos and madness. If the coach driver wasn't pulling over to rant explosively at us for disrespecting the school by constantly singing about him, then my peers were robbing the Little Chef of all their complimentary lollies. And this wonderfully, exuberant pandemonium is pushed to the forefront of Our Day Out to provide a pang of nostalgia for anyone who's ever been to school (that's all of you). However, Willy Russell is far too clever to make this play into little more than a smorgasbord of schoolchild anarchy. Instead, Russell allows a blatant political and social message to manifest itself throughout the play. It's clear from the off that the future paths of the children in Our Day Out were laid long before they were born. Destined to follow their parents into a nicotine stained world of menial factory jobs down by the docks, there's no time for Digga and Reilly to take note of the beautiful architecture standing out like a sore thumb in their home town. Carol, however, is slightly younger and dreams of escaping the murky greys and browns of what she reluctantly calls home. Mrs Kay suggests to Carol that she can escape, but deep down the teacher knows that Carol too is resigned to her downbeat destiny. And the conflict between Briggs and Kay over the children's future underlines the difficulties heaped upon education. If anything, Briggs is somewhat of an idealist who believes any child can be saved if they're guided by authority and, therefore, granted respect. It's a curious argument given the apoplectic tongue-lashings he's prone to administering, but beneath all the rage he has the children's best interests at heart. Kay, meanwhile, is much loved by her pupils, but remains a secret pessimist about their futures and, instead, is keen for them to enjoy themselves to the full on their day out. Again, she has their best interests in heart, but it's in sharp contrast to Briggs' more militant approach and demonstrates Russell's skill for intricately designed characters and narratives. Neither approach, of course, is right or wrong. Education, on its own, is unable to provide a panacea for the ills of society and the many social injustices imposed upon it. A major social revolution would be required to provide any sense of equal footing and, 40 years on from Our Day Out, this seems as unlikely as ever with the levels of child poverty in Britain still reaching staggering levels. All these weighty thoughts are, naturally, far from the thoughts of the children in Our Day Out as they're keen to tap into nothing more than Kay's emphasis on carpe diem. Despite their exuberance, there's constantly a bittersweet undercurrent as we all know where these children are headed, but for the duration of Our Day Out it's difficult not to revel in their youthful ignorance. The whole play is helped in communicating its social messages through a series of fantastic performances. Many of the children involved were picked from the local area and had no formal acting experience, but they're a step above the majority of child actors from the 1970s who it's fair to say were mostly wooden and stilted at the best of times. These naturalistic performances are married to the adult actors who barely need any introduction. Alun Armstrong and Jean Heywood, in particular, are phenomenal and deliver masterclasses in range. As a result, Our Day Out rattles along with an engaging pace which makes you wonder if it could have been expanded slightly further to help bring in Colin and Susan's subplots which, although perfectly resolved, deserve a little more meat. 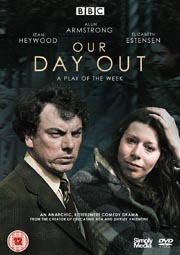 Nonetheless, Our Day Out is a fantastic slice of social commentary which remains timeless even 40 years on. We can all associate with the sentiments of regret and a lack of opportunities to varying degrees and, much like Briggs' about turn at the end of the play, we understand (even if we don't approve of it) that the status quo is somewhat of an immovable object. A thought provoking piece of art, Our Day Out is now available from Simply Media and Curious British Telly readers can receive a 10% discount by entering CURIOUS10 at the checkout. Our Day Out (BBC2) was a gloriously funny and touching play by Willy Russell about a coachload of backward kids going to the seaside. “Christ, they’re all bloody backward round here” says the lollypop man, somewhat soured by constant contact with youth. The play, a lovely plate of chips, is lavishly sprinkled with the vinegar of adult disapproval. “Most of you don’t know how to enjoy yourselves, so I’ll tell you,” says the master in charge, his nose burnished with rage and fear. “On a coach trip we sit quietly in our seats and We Don’t Do Anything Else” This, as it proves, is optimistic. One thinks of vandals and Visigoths and Manchester United as of the good old days. The exceptional acting of the children, particularly Julie Jones as the desolate Carol, should probably partly be credited to the director Pedr James. Children being good as you allow them to be. The Broadcasting Press Guild is just now voting on its annual television awards for 1977; members can nominate a first and a second in each category, and I have put Stoppard’s Professional Foul second as Best Single Play. For first I have voted for Our Day Out (9.25 BBC1) by Willy Russell, being quickly repeated after having been “lost” in the period between Christmas and New Year. This homely morality is a small masterpiece of film-making. The director, Pedr James, has coaxed out of 30 Liverpool children performances of incomparable naturalness, contrasted with moments of sheer surrealism of the order of Zero de Conduite. His adults hold their end up, with an outstanding performance by Alun Armstrong as an unpopular schoolmaster who takes himself the task of disciplining a backward class on a coach outing. Jean Hayward, as their kind teacher, keeps her temper one memorable outburst about how they are being trained as factory fodder. Elisabeth Estensen, as a teacher much ragged for a romantic liaison, shows that she can rise above the inanities of the Liver Birds. In the course of 70 minutes, I laughed out load a great deal, and secretly wept a little. Originally commissioned in the Play for Today slot on BBC TV in 1976, and work-shopped into a small-scale stage version for the Everyman Theatre, Liverpool in 1983. Willy Russell's Our Day Out - about a class of inner-city teenagers on an end of term outing - gets a new lease of life at the Belgrade Theatre, Coventry, with a script reworked and expanded by Russell himself. Athough the Liverpool version spawned many successful productions, Russell has always regarded it as "unfinished business". "I've seen productions in which it worked - mainly on the backs of the kids in it - but I've always wanted the chance to make it a better, more crafted night at the theatre rather than a film script with a few songs added on." He explains. His chance came with the arrival of Bob Eaton as artistic director at the Belgrade. He took up his position this Spring (1996), at the height of the Belgrade's confrontation with Equity over the future of its Education Department. At the start of his first season, Eaton wanted to reaffirm his commitment to young people and the local community with a show which would do justice to the Belgrade's thriving youth theatre. Our Day Out, with its battery of meaty roles for teenagers, was his choice, but having directed the 1983 production he was well aware that it could easily be swallowed up in the Belgrade's 800-seat auditorium. Willy Russell was keen to develop the play and update it for the nineties, now that the subject of how best schools can serve their pupils seems to be more hotly debated. "In the characters of Mrs Kay and Mr Briggs, the play really presents two opposed educational ideologies on stage," Says Russell. Mrs Kay is not a liberal softie, she's a good pragmatic teacher who knows instinctively that there's more to education than a diet of facts and figures." Mrs Kay wants her "Progress Class" - "Where you go when you're backward, like," explains Carol - to have a wonderful day out. But her plans are hi-jacked by the severe Mr Briggs, who wants to make the trip "educational". Alton Towers is too frivolous, so he diverts the coach to Conway Castle for "a dose of heritage". "This is the nature of the great debate in education at the moment," says Russell. "Our headlong pursuit of 'standards' and the creation of successful, marketplace children, has left a terrible and ever-growing underclass of disaffected youngsters who see no hope and no place for themselves if they don't have the right grades. I can understand the concerns of people like Mr Briggs, but he thinks that Mrs Kay is bringing in Anarchy. She isn't - she simply recognises the children's needs. A good night out is certainly what Russell gives his audience in Glen Walford's production. The story of the outing sizzles along with robust, full-hearted performances from the 14 youth theatre members who produce some sharply observed cameos and poignant moments when their characters' vulnerability and near despair can be glimpsed behind the bravado. The five professional actors bravely taking the adult roles keep their end up, notably Lyn Whitehead as the motherly Mrs Kay. Eventually, Mrs Kay and the sad little waif, Carol, momentarily touch a nerve in Briggs' rigid heart and so rescue the outing. "Why can't it always be this good?" sing the happy youngsters on their way home - and we echo that emotion." “The highlight is the performance of the young cast who perhaps quite rightly completely overshadow the older actors. The youngsters are convincing and thoroughly engaging from start to finish. Willy Russell wrote Our Day Out in 1976 and only now is it right for the musical stage. After a complete overhaul the former television play is now an engaging show about a "progress class" and its day trip, which enjoyed a standing ovation on press night. Okay, so putting local youngsters on the stage is guaranteed an audience full of proud mums and dads, but it's rare to find a group of kids - plucked form local schools - that perform so well, notably Declan Bennett, Bethan Webb and 11 year old Elizabeth Brennan as Carol Chandler, the girl who dreams of escaping her inner-city existence. They sang well, kept their characters throughout and carried off the show with a refreshing charm. Despite the age of the piece it hasn't dated. The biting comment on the education system remains appropriate for today and although these 90s youngsters swear and blow condoms up, they still crave affection, attention and a future. It's a classic Russell with a typical Blood Brothers Tell Me It's Not True style finale which starts simply adding voices until the final powerful chorus. There's no technical wizardry apart form a versatile bus and no glitzy show tunes but It's likeable, lovable, funny and fun. Make Our Day Out your night out. The Belgrade's winter season kicked off in fabulous form last night with Willy Russell's adapted comedy. Hilarious yet touching, this musical journey illustrates the joys and agonies faced by a class of teenage tearaways from an inner city comprehensive school on an end-of-term trip. The original plan to go to Alton Towers is abandoned at the last minute when strict (played by John wild) finds out and redirects the coach to "boring" Wales. But even old Briggsy couldn't have planned what is in store for him when they get there. Realistic to a fault, the language of the progress class is something to be desired, and therefore not for the very young or easily offended. But from the response of last night's audience the rebel's antics certainly rang a few bells. And whoever said never work with children and animals were certainly proved wrong last night - they managed it perfectly with goats, chickens, rabbits and a giant python. The real stars of the show were the youngsters themselves. Picked from local schools, two casts perform on alternate nights. Special mention has to go to Bethan Webb as love sick Lynda and Elizabeth Brennan as loveable Carol. Brilliant, funny and entertaining - Our Day Out makes a perfect night out. Willy Russell has re-written Our Day Out 20 years after its first television appearance, specially for this Belgrade production. The basic plot and major concerns of the play remain largely unchanged, however, despite the occasional reference to CD Roms and a peppering of vocabulary that would ensure a late evening slot in 1996, let alone 1976. Mrs. Kay's "Progress Class" (an excellent touch, as no one them to make any) are setting out on a trip to Alton Towers. But when fellow teacher Briggs finds out their non-educational destination he directs them to Conway Castle in the name of edification. Mrs. Kay (Lynn Whitehead) and Briggs (John Wild) represent two opposing educational approaches, doing battle for the children's hearts and minds. Russell's play comes down firmly against traditionalism - no surprises there. The best surprise of the evening (and there are a couple of good ones) is just how good the local youth actors are. A play where school age actors heavily outnumber professionals is a risky enterprise, but these are some of the most accomplished and enjoyable youth performances I've ever seen. The director (Glen Walford) and associate director (Terry Malone, a former Belgrade Youth Theatre member himself) have done an excellent job in integrating professional and amateur actors so seamlessly. The barbed-wire rimmed set, establishing a bleak urban setting, focuses on the coach which deconstructs to serve as a zoo, a castle, a cliff and a fun fai, with a little imagination on the audience's part. Live music accompanies the songs - funny ones, poignant ones and a couple of tear-jerking belters. As in Blood Brothers, Russell takes some of the hopelessness and ugliness of underprivileged lives and gives them an emotional treatment that steers perilously close to sentimentality. But as shameless emotional manipulation often makes good theatre, this performance ended with a well-deserved standing ovation.